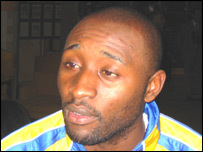 Portsmouth striker Lomana Lua Lua has set up a foundation for street children in his native DR Congo. He has built a hostel, sport and education drop-in centre in the capital Kinshasa, where he plans to employ nine full-time staff by the end of 2006. He said he was shocked into taking action during his visits back to the country where he is a national icon. "Going back there and seeing war orphans...by giving a little bit back I hope to make a difference," he said. Lua Lua, who is the DRC's national team captain, arrived in the UK as a refugee in 1989, aged nine. He told the World Service's World Football programme that he always enjoys visiting the country of his birth. "I love it and I miss it," he said." It's sad and a shame with what's happening with the war but there's nothing like being at home." The central African country has just had its first democratic elections in 40 years and following a five-year civil war. Growing up in east London, Lua Lua said the local youth centre was what kept him off the streets. "I figured I could do something like that back home, where children could get advice," he said. He hoped the foundation would keep children off the streets and give them an opportunity to fulfil their potential. "I always believe there will be a change in our country and it will get better and this is a good way to go about it," he said.